The success of any firm relies on the type of services it provides and the level of expertise and experience that is being offered. What is equally important is how your firm is using marketing to communicate to your potential clients. The educational system doesn’t teach you about marketing strategies, but that is why we’re here. We have compiled a list of our top 5 tips on how to promote your service business. Let’s take a look. Before we dive into this topic, there are a couple of things we need to discuss first. As a service provider, you specialize in certain areas. So when it comes to your firm, you obviously want to work with specific clients who need your specific services. In order to market to those potential new clients, you need to know specifically who your target audience is. This is the first step, and will help your marketing create a better return on your investment. You may not sell a physical product, but the service you provide is just as tangible. As you read on, keep in mind that your firm is a brand. The tips listed below will greatly assist in taking your ‘brand’ to the next level. Networking is critical to your business. It is essentially your gateway to new clients. Word-of-mouth communication is everything to service businesses. It not only helps your list of clients and contacts grow, but it also benefits your reputation. Frequently keeping in touch with former classmates and colleagues, attending networking events, and joining networking groups will build your referral network. Testimonials and reviews are vital for a service-based organization’s survival. Without positive client experiences and glowing referrals, your firm may have difficulty growing. In a service-type of business like yours, what the customer says and thinks carries a lot of weight. It allows potential prospects to see what you have done in the past, in the words of those who elected to work with you. In other words, the testimonials and reviews are social proof. They can also help when it comes to recruiting new employees for your firm. You need a website—no question about it. The design, functionality and user experience need to be on point. In this new paradigm of digital marketing, your potential clients are selling themselves online. Your website is doing a lot of the heavy lifting in your buyer’s journey. Showcase the areas you specialize in and show your strengths. If you can answer these questions, you’re on your way to a powerful site that will generate leads and opportunities. What can you do that others cannot? Why would someone want to do business with you vs. your competitors? To add another layer to your website, you might also want to consider starting a blog. A blog is a great way to voice your knowledge and expertise as well as help get your site ranked on search engines. Once you have an effective website, you must then get it in front of your prospects. There are a number of ways to do this, but search engine optimization (SEO) is a must. Your site has to be ranked high on all Google and other top search engine searches for your service. And despite what some people may say, only an experienced professional SEO expert can effectively do this. As a service firm, do you really need to have a social media presence? The answer is yes, but you do not necessarily have to be on every channel in existence. Pick the ones that your target market(s) are using. You’ll want to post about your services, experiences, testimonials, etc. Social media is an opportunity to give people a behind-the-scenes look at what you do, not just professionally, but also what you do to give back to the local community: charity work, sponsorship opportunities, and fundraisers. Write about what your target market wants to learn about…not what you sell. Your social media presence also gives you the chance the make connections and to network, which can lead to potential clients and referrals. It’s easy, inexpensive, and if done right, will have a high return on investment. Approximately 92% of U.S. adults use email regularly so it’s an obvious way to stay connected to current and past clients, as well as future prospects. Information about your services, new client testimonials, a new blog post or local charity work are all worthy content for an email campaign. And finally, when it comes to building a successful business, you must track and analyze the results for every point listed above. If you want to grow and progress as a successful service firm, this is something you must do regularly. 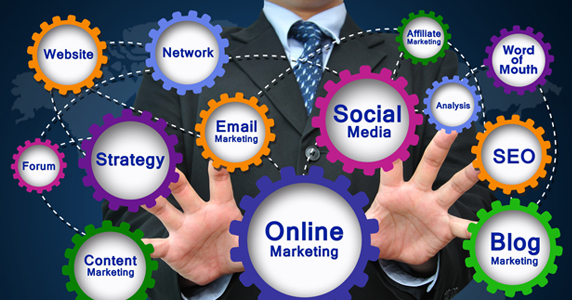 This is not a simple task, so you should rely on the expertise of a qualified marketing company. Well, there you have it. If you need help getting started, call the experts here at CGT Marketing and we will get you on the path to success.